Mnangagwa on February 16 boasted that he deployed the army to deal with violent protesters despite complaints by human rights groups that soldiers had allegedly killed at least 17 people and raped several women. Mugabe, who was toppled by the army in 2017, took advantage of his 95th birthday celebrations held at his Harare mansion to launch a renewed attack on Mnangagwa, telling him that he was not God. According to accounts by some of the invited guests, Mugabe's speech was emotionally charged, which could be an indication that his relations with his protégé are strained once again. Jealousy Mawarire, the spokesperson of the Mugabe-linked National Patriot Front, first posted about Mugabe's outbursts on Twitter. He quoted the former Zanu PF leader saying: "You are at the top, you want to glorify yourself. "You are not God. Today you are at the top, tomorrow you will be at the bottom, know that. "God has His own way of punishing rogues and cruel people." Mugabe then thundered: "I am telling you in your face. I don't care what will happen to me." He said the army must stop killing people and return to the barracks. "People should love their army, they should not fear the army," he said. Several people confirmed that Mugabe made the remarks, but were unable to give more details as the celebrations were still on by the time of going to print. 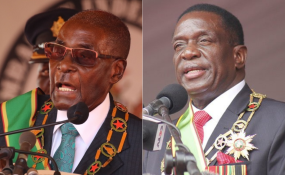 Mugabe fired Mnangagwa as his deputy in November 2017 before the army, led by then commander and now Vice-President Constantino Chiwenga, moved in to topple him a few days later. Last year, Mugabe also used his private birthday celebrations to attack Mnangagwa and on the eve of the July 30 presidential elections told his supporters not to vote for the Zanu PF leader. However, the two appeared to have mended their relations after the elections and Mugabe said he now accepted that Mnangagwa was the new leader. Meanwhile, Mnangagwa yesterday condemned Zanu PF supporters that were terrorising people in Harare South and threatened to descend on them. Officiating at the burial of former Cabinet minister Callistus Ndlovu at the National Heroes Acre in Harare, Mnangagwa said action should be taken against the culprits. He cited Harare South where his nephew Tongai Mnangagwa is the MP. "Let us desist from divisive politics. Such kind of politics has no place in the new Zimbabwe," he said. "We condemn in strongest terms actions by some hooligans with a hidden agenda who went about attacking people in Harare South while in Zanu PF regalia and destroyed people's stores and merchandise, destabilisations of peace" . "This is criminal, this will not be tolerated." Ndlovu's burial resembled a military parade as it had more soldiers than the usual Zanu PF supporters. Ndlovu (83), also a member of the Zanu PF central committee, collapsed and died a week ago in South Africa where he was being treated for pancreatic cancer. Ndlovu is survived by his wife Angeline, five children and seven grandchildren.